Protest Tory Budget day...& get ready for the 26th! ... Next Leeds against the Cuts meeting 31st March Thurs at 5.30 pm, TUC centre 88 North Street - ALL WELCOME! There will be stalls against cuts and building for the 26th demonstration in the city centre 1 pm onwards, come give us a hand or buy some tickets for the 26th coaches from Leeds. Armley high street and Headingley Arndale centre stalls will in addition be against the impending closures of local day and crisis centres. SOLIDARITY WITH THE LECTURERS' STRIKE: Lecturers in the UCU union at Leeds Uni and Leeds Met are striking on Thursday 24 March against attacks to their pensions (and Leeds Uni UCU on tuesday as well against local attacks in addition to pensions and conditions). Bring your banners, send a delegation, forward your donations and messages of support to m.j.w.povey@leeds.ac.uk. Just when you thought it was safe to sit back and enjoy your public services, health care and education won by generations of workers past, Cameron Clegg and Osborne announce another raft of cuts. Bring placards, banners, and lets make some noise to get ready for the 26th. Calling all trade unionists, lowpaid workers, unemployed, students, day centre users, NHS campaigners...etc etc. Everyone's getting together to organise local anti-cuts campaigning to defend our jobs and services, and to discuss the way forward locally and nationally for the anti-cuts movement after 26 March. Get in touch and help organise the workshops around local cuts, education cuts, NHS privatisation, etc. Public services, benefits, education, pensions, the NHS – everything the working class has won over the last decades to make life better is at risk as the Tories prepare to privatise and cut their way through another term of office, and finish the job that Thatcher began. Get in touch with Leeds Against the Cuts and book your tickets now to get down to London on the 26th. - Coaches cost £20 for workers, £10 for university students, £5 unemployed/school/college. Solidarity price add £5. - Please pay the full price of your ticket upfront. We need a deposit £5 deposit to reserve a ticket. - Make cheques out to "Leeds TUC" and post to Leeds TUC 88 North Street, Leeds, West Yorkshire, LS2 7PN. Please email, text or phone to let us know you have booked some tickets so any delays or losses in the post can be fixed as soon as possible. 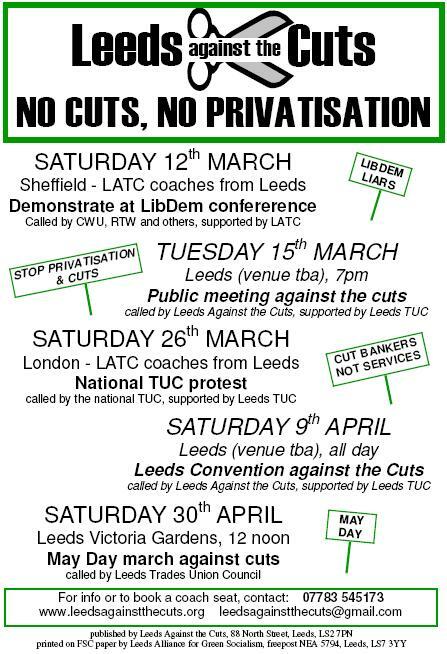 Notice: Leeds Against Cuts meeting on local cuts scheduled for this Tuesday was cancelled in favour of building a Day of Action this Saturday in Leeds against all the cuts, and a Budget Day protest on 23 March. Leeds Against the Cuts meets this Thursday at the Leeds TUC centre, 88 North Street at 5.30 pm, please come along and help us build a good day of action and the 26th March demo. ALL WELCOME! Leeds Against the Cuts is inviting local anti-cuts campaigns to take action - a protest, a stall, a leafletting, a meeting - this Saturday to highlight the council's cuts budget, continue the campaign to reverse damaging cuts to local sports centres, libraries, youth centres and day centres, and build for 26 March. There will be Leeds Against the Cuts stalls in the city centre too, so come along to that if there is nothing local and give us a hand getting the word out. More to come as news of local protests comes in so watch this space, or better yet organise a local protest yourself! Leeds Against the Cuts can provide materials and support. Just when you thought they'd cut enough, more slash and burn policies are to be announced on Budget Day on Wednesday, so come protest in City Square on Wednesday at 5.30 with your neighbours, workmates, friends and family, bring your union banners of home made placards and lets make some noise, and get ready for the mega demo on the 26th. A day of discussions and workshops to plan city-wide campaign activity against cuts to health, education and local services. - Coaches cost £15 for workers, £10 for university students, £5 unemployed/school/college. Solidarity price add £5. Leeds Against the Cuts meets this Thursday at the Leeds TUC centre, 88 North Street at 5.30 pm, please come along and help us build a massive 26th and Leeds Mayday demo! The Community Speaks out! Anti-Cuts Meeting next Tuesday 15 March at 7 pm, Leeds Met with speakers from invited from various community campaigns, UCU lecturers' dispute. Get ready for the 26 March TUC anti-cuts demo in London! Leeds protest update: Womens' Day and LibDem conference. This International Women's Day should be a day of protest against cuts. The prediction that over 70% of the cuts will fall on the shoulders of women is a reminder that the fight for women's liberation is far from won. Get in touch with Leeds Against the Cuts and book your tickets now to get down to London on the 26th! What is Leeds Against the Cuts? Leeds Trades Council set up Leeds Against the Cuts to oppose the huge cuts to jobs, welfare and public services. If you're a Trade unionist, student, working, unemployed or retired, join us fighting the cuts. We meet weekly Thursdays at 530 pm, TUC offices, 88 North St.
Leeds Against the Cuts encourages everyone in Leeds to join protesters in Sheffield for a demonstration at the Liberal Democrat Conference against the cuts. The demonstration will take place on Sheffield Saturday 12 March 2011.